I've had stretched ears for many years. People ask me questions about it all the time. Here is a guide for those who are interested. Gauges is an incorrect term that a lazy person who hasn't done any research on the matter made up. Just because the jewelry is measured using the gauge system does not mean they are called gauges. They are called plugs or eyelets. If everything was named this way, then shoes would be called sizes and beverages would be called ounces. If you are too lazy to do some research on such a drastic body modification, then you shouldn't be stretching your ears in the first place. The correct use of the word 'gauge' is a means of measurement, such as a 2-gauge plug. The act of stretching ear lobes: ear stretching. 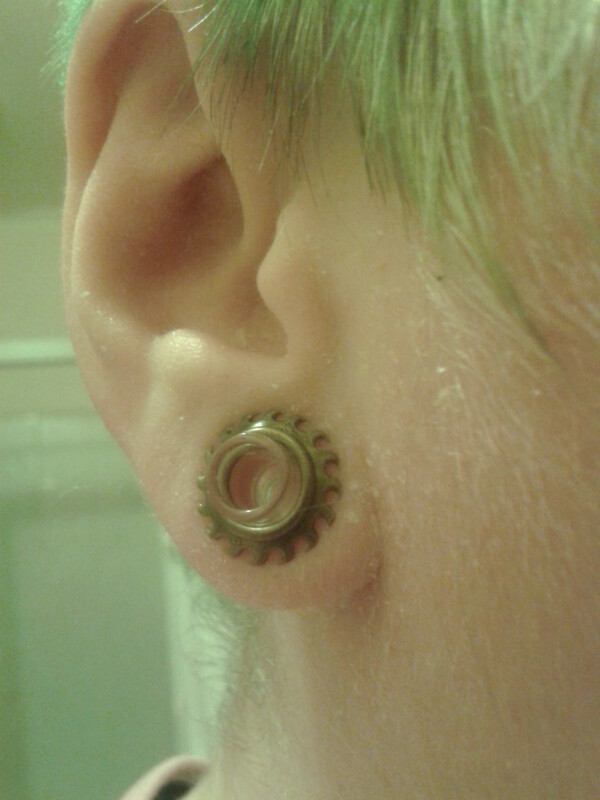 Gauges should be jewelry. Gauging should be stretching. O-Rings: A silicone ring in the shape of an O that is used to stop jewelry from falling out of your piercing. 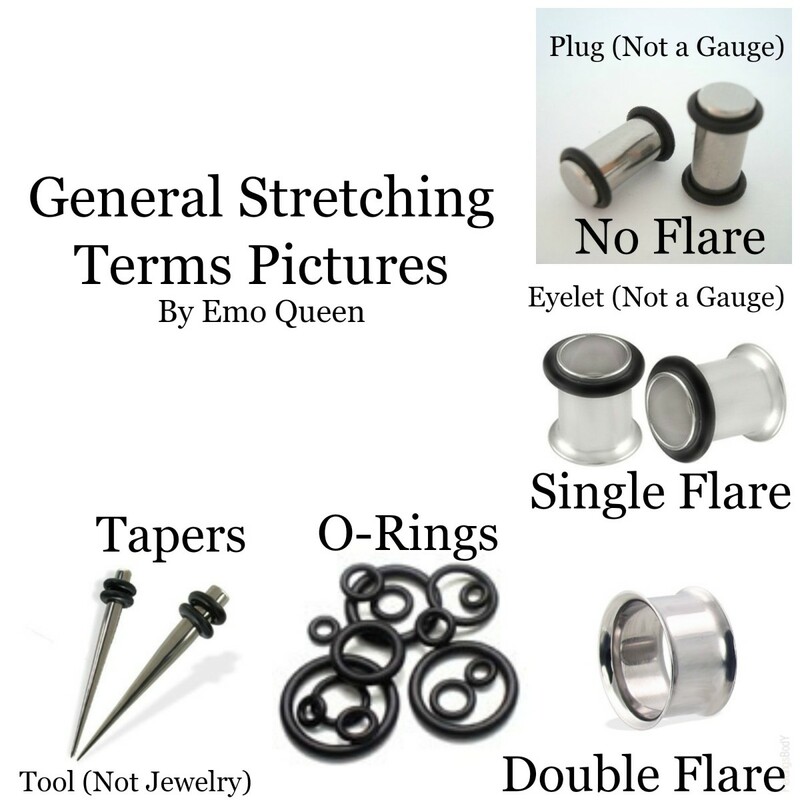 Single Flare: A piece of jewelry that is flared, or slightly larger, on only one side, usually secured with an o-ring on the no-flare side. The flare is typically 1-2mm larger than the wearable area. Double Flare: A piece of jewelry that has two flares, one on either side of the piece. These are not called saddles. No o-rings are worn with these. No Flare: A piece of jewelry that has no flare, or is straight all the way across, usually secured by an o-ring on each side of the ear. Fistula: Skin tube created when a foreign object is inserted into the body — the inside of your piercing. Are your ears currently stretched? If so, which size range do you fall under? No, my ears are not stretched. Yes, my ears are stretched 11mm-25mm OR 7/16"-1"
Yes, my ears are stretched over an inch OR more than 25mm. Tapering Method: Lubing up your ears and taper with some kind of natural oil (more on these oils below) and inserting the taper through your fistula until the very end of the larger side is at the front of your ear, then following through with a plug or eyelet. This method should only be used up to ~2g because after that, the increments in between sizes become to harsh for your ears to handle, and that's how blowouts happen. Tapers are NOT jewelry; they are a tool for stretching. Wearing tapers in your ears would be the equivalent of wearing a needle in your face instead of putting in actual jewelry. Dumb, isn't it? Yes. Don't do it. Taping Method: Wrapping a few layers of non-adhesive tape around an eyelet or plug (not tapers) and popping the slightly larger piece of jewelry into your ears with lubrication. You should not have to force the taped jewelry in. If you can't get it in, take off some of the tape. Continue to do this until it fits comfortably in your ear. Do this every few days (4-7 is recommended) until you are at your next size. Natural Method: Waiting until your ear has become loose enough on its own to put in a larger piece of jewelry with ease. Using no tools or help. This is accomplished by wearing heavy jewelry (not weights, just solid jewelry made out of heavy materials, such as stone) and having lots of patience. Plugs: A completely solid piece of jewelry. Plugs are a straight design with o-rings to secure it in place. Some come grooved to better hold o-rings in place. This is the most popular style for stretched lobes and offers the most design and style options. Every day a new plug comes out with a different decoration, character face or color combination. You will find plugs in all materials, colors, and designs the styles seem to be endless. Keep in mind that the larger you go, the more expensive the jewelry becomes. Larger sizes require more material and more often than not such large gauges are made in smaller quantities and even by hand. Eyelets: Commonly called a tunnel. A piece of jewelry that is hollow all the way through. If you can stick things through it, it's an eyelet. A straight shaft with a hollow center secured in place by o-rings. Some come grooved to better hold the o-rings in place, so they don't fall out and get lost. Eyelets allow you to see through the lobe which is easier to do with larger sizes. You can also wear captive rings and circular barbells through them to change up the look from time to time, but other than that, there aren't too many decoration options available because of the plain open end. Surgical Stainless Steel: Steel, specifically 316L surgical steel, is widely considered the best choice when stretching your ears from one gauge to another. It can be boiled or autoclaved (if you have one available) and is non-porous, which greatly reduces the chance for infection. They generally insert smoother than other types of material and are virtually indestructible. Stainless steel can be a perfectly acceptable alternative to surgical steel, but it can contain nickel, so if you're sensitive to nickel at all you need to either pay a bit more for surgical steel or go with glass. Glass: Glass is another great choice for stretching to a new size, but you need to be picky with the type and style to ensure that it's not prone to breaking. Typically avoid glass or stone tunnels and stick with either a single flare or no flare plugs. For those who have reactions to certain types of metal, glass is often the best choice since it does not react with the body. Stone: Stone can also be used when stretching using the natural technique since stone is generally a heavier material. 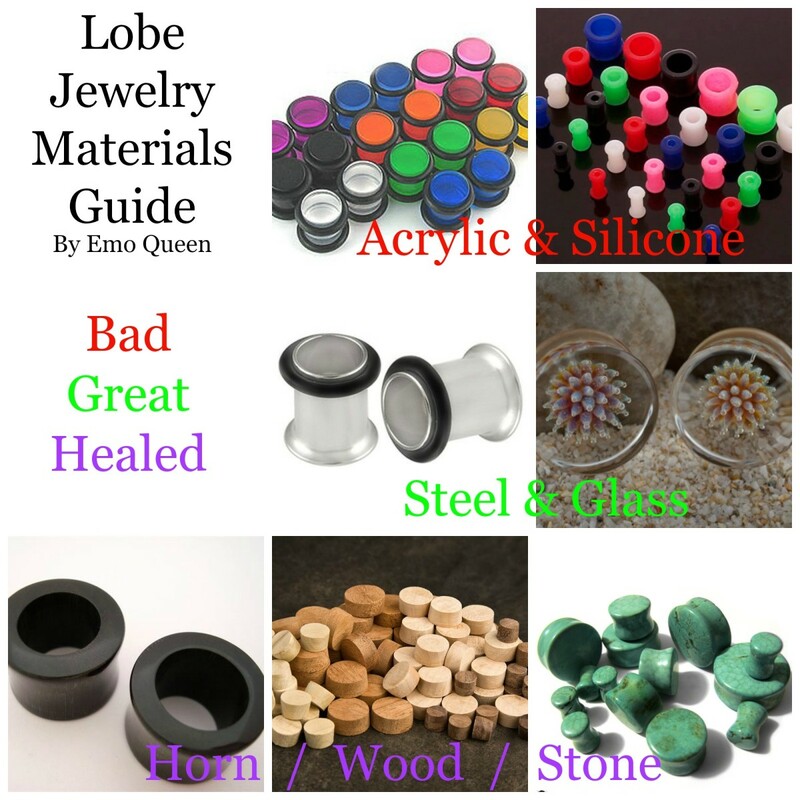 However, different types of stone are more porous than others, so if using stone for ear stretching, non-porous stones such as quartz, obsidian, or opalite would be desirable. Wood: Wood is great to use after your stretch has healed. Never put wood in a new stretch. Some people have allergic reactions to certain types of wood. Ebony, Bloodwood, and Coconut Wood rarely trigger allergic reactions and are the safest to use. An advantage is the ability to absorb your natural oils and sweat; this will reduce the funk that often occurs with metal or glass jewelry. Do not soak, autoclave, leave in direct sunlight, store in extreme temperatures or the bathroom, wear swimming or bathing. Other Organics: Organic gauges such as horn and bone are another popular choice because of their natural aesthetics and ability to be carved into amazing designs. But the main issue with organics is that the materials are naturally porous, which make them a very poor choice when you're attempting to stretch your ears to a larger size. The porous nature of the material allows for bacteria to get trapped, which can lead to a higher instance of infection when your ears aren't fully healed. So while I definitely recommend organic earrings for well-healed ears, please refrain from using them if you're new to stretching or aren't fully healed from your last gauge up. Acrylic: Never, ever, ever recommended. Not only is it porous (meaning it can harbor much bad bacteria and has the potential of your tissue growing into it), but it also is toxic and can leach carcinogens into your skin, and it’s also easy to break— do NOT wear acrylic after a fresh stretch and once the piercing is fully healed, only wear it for short-term. Silicone: Do NOT wear silicone. Silicone is often chosen because it's easy to insert into an existing piercing due to the fact that it's soft and flexible. 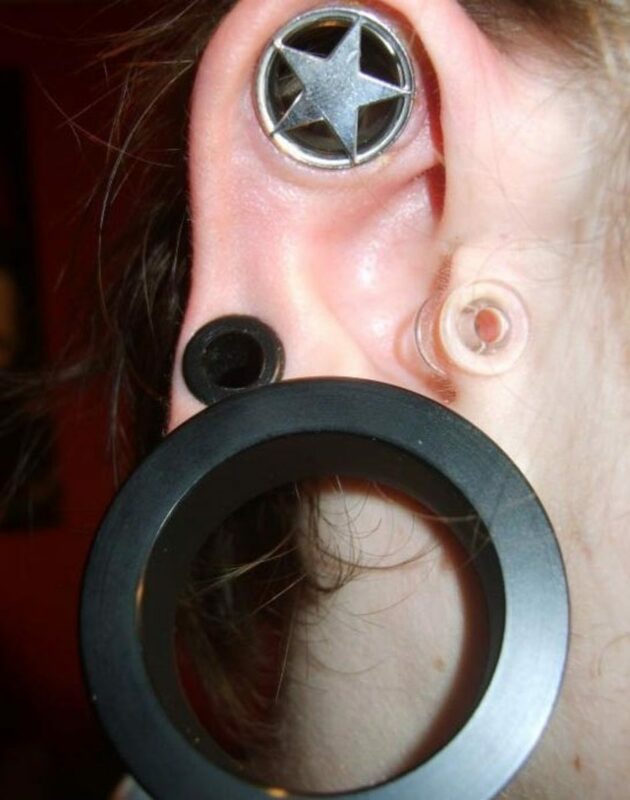 However, that is also the reason why I don't recommend it, especially with newly stretched ears. Silicone can bend perfectly with your skin, creating an airtight fit that can trap bacteria and cause infection. Don't ever stretch with silicone, as tempting as it is, because it's too abrupt and will tear your ears. 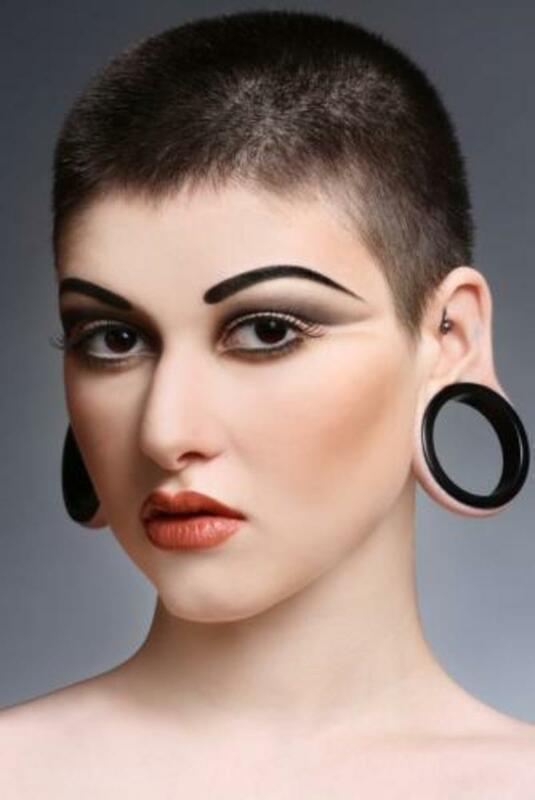 The Point of No Return: The majority of professionals in the body modification industry recommend never going any larger than 2 gauge if you want your ears to totally close up to where you can't see through them. Keep in mind though that everyone's anatomy is different, but the majority of people will be able to take their plugs out at 2 gauge and your lobes will look normal after a few months without any disruption. If you have stretched to a really large size and decide that it is not for you, then there is always the option of surgery. Lobe reversal has become pretty popular these days so that is always an option to consider if you have stretched really large and want your lobes to look like the average person's. Where to Start: For the majority of people, 16 gauge is a good starting point if you have only ever worn regular earrings. How Long to Wait Between Stretches: Many people make the mistake of stretching too fast which can cause some long term damage to your lobes. Most professionals recommend waiting at least a full month between each stretch. A full month is generally enough to give your last stretch time to heal, and also to help your lobes loosen up a bit for the next stretch. The slower you go, the nicer your lobes will be in the long run though, so waiting even longer than a month is highly recommended. Even though the temptation is hard to resist sometimes when you are ready to stretch, it's always best to give it some time, you will thank yourself in the long run. 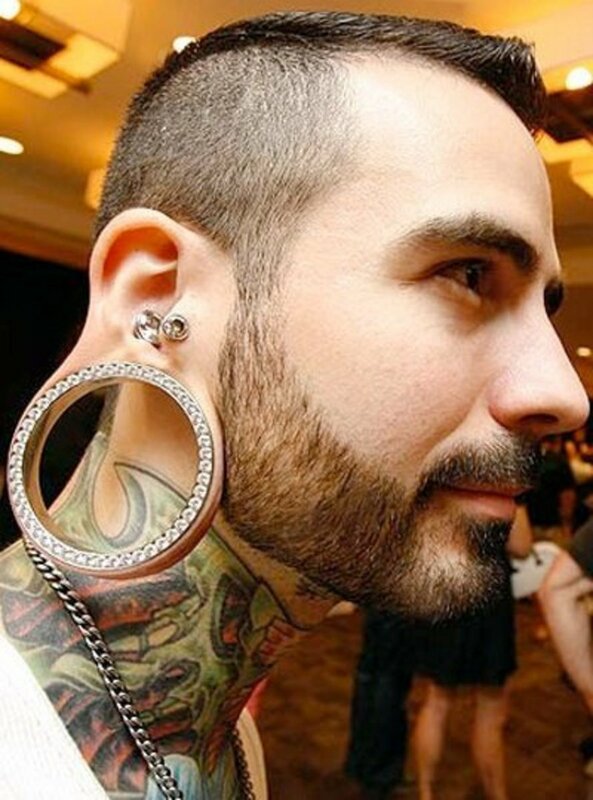 Dry Stretching: Sizing up your lobes without lubricant. Dead Stretching: Shoving a piece of jewelry that is larger than your current size into your ear. Dry Dead Stretching: Shoving a piece of jewelry that is larger than your current size into your ear without lubricant. A.k.a. Blowout City. Blowouts: When the fistula is actually forced out through the back of the piercing. A blowout is a small flap of skin that will hang over the edge of your plugs. Though it is not generally too noticeable if it occurs on the back of your ears, it can limit the type of plugs you wear, and you will generally need to wear plugs with a bigger wearable area to allow room for the blowout. If you skip sizes or go to fast on a blowout that has already occurred, then it will often continue to get bigger and bigger. The best way to help get rid of a blowout is to take your plugs out immediately after you notice it and downsize 2-3 sizes smaller so your piercing will start to heal itself. Though it is never 100% guaranteed that it will go away, the chances are pretty good of it going back to normal if you downsize immediately after it happens. If you leave the blowout to heal up without downsizing though, then it will generally heal up for good that way and become permanent. There is also the option of getting it surgically removed which is highly recommended if you have the funds to do so. Infections: You may have an infection if you are noticing issues such as extreme swelling, redness, discharge, itching, and hotness. If you have recently stretched your ears and are having all of the above problems, then it's for sure best to downsize and let your ears get back to normal. Also wearing jewelry like steel or glass is the best to wear with an irritated piercing as these materials will minimize your risk of prolonging the infection. If you feel like it's getting too much or is a serious problem, then please see a doctor. Tears: You create micro-tears in your ears every time you stretch, however, a tear-tear is just as you'd assume. 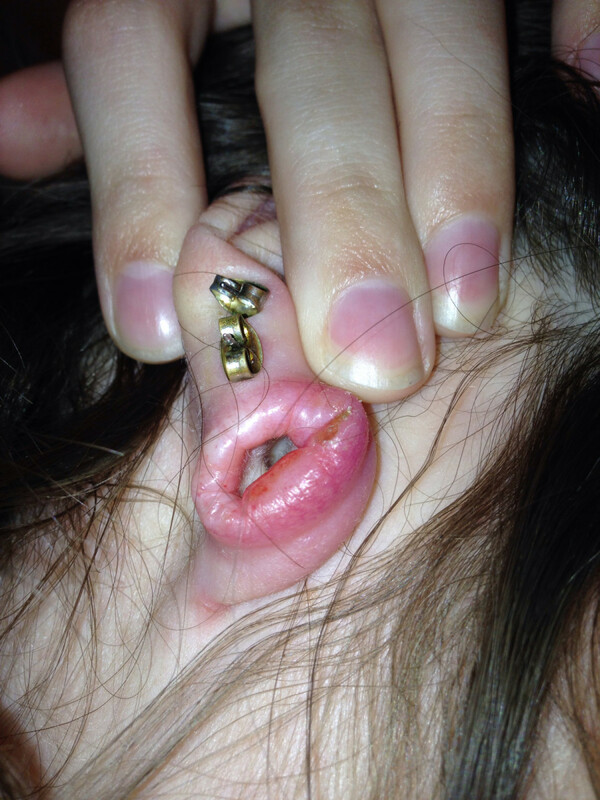 When your lobe completely gives way and rips open. 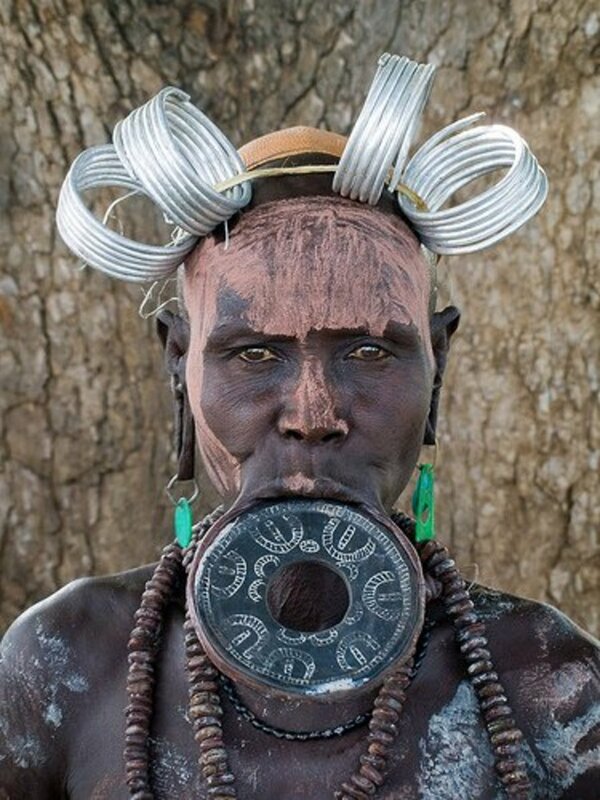 You no longer have a circular lobe; you have two dangling pieces of skin. The only way to correct this is with surgery. See a doctor immediately! Ear Funk: Ear funk is essentially the dead skin cells of the inside of your ears being trapped in the inside of your fistula. When you wear plugs for several days, the dead skin cells start to build up on your jewelry and when you remove the plugs they can be super gross. The way to get rid of this issue is either to wash out your ears daily in the shower or to just wear organic plugs, so they soak up all of that ear funk and keep your ears dry and smelling fresh.